The Orenda Engines-built J79-OEL-7 rated at 10,000 lbs. static thrust dry and 15,800 lbs. s.t. with afterburner. Internal Fuel 5,750 lbs - Total with tip and pylon tanks 10,495 lbs. 915 mph (Mach 1.2) at sea level. Climb to 30,000 feet in 1.5 minutes. Wing area 196.1 square feet. Laid out in V-shape in front are 6 100-round belts of 20 mm ammunition for the M61A1 Gatling type cannon. Behind the 20 mm rounds are 72 CRV-7 rockets, which are laid out 38 to a side representing the maximum rocket load of the aircraft. On both extremities of the main row are BLU-1 (on the left) and BLU-27 (on the right) Napalm (fire) bombs. The white containers on the inside of the Napalms are CBU-1 Cluster bombs. They would make use of ram air to assist in the ejection of the bomblets out of the dispenser, thus the red cap in front. Next in dark blue, we have BL-755 Cluster bombs of British design and conception. They contain 147 bomblets and they open up in flight releasing the bomblets that are distributed to an area roughly the size of a football field. 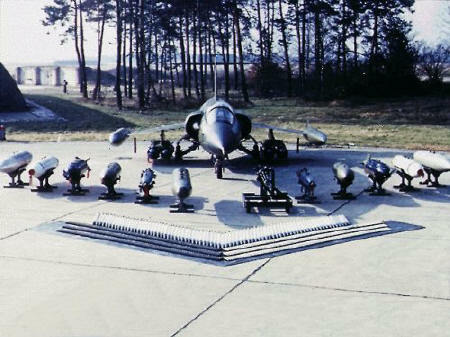 In olive drab colour with a black circle on the nose are LAU-5003 rocket launchers, which are comprised of 19 tubes enabling the transport and firing of 19 CRV-7 rockets. As seen on the aircraft behind two per side can be carried to account for the 76 rockets in front. Of smaller diameter and blue in colour are the 500 lbs MK 82 General Purpose Bombs (Snakeye). The inside most weapon on the right is the M61A1 20 mm Gatling type cannon on a stand which was belt fed with up to 600 rounds and driven by an electric motor. Under the wings of the aircraft are two TSC (Twin Store Carrier) supporting 2 BL-755 Cluster Bombs each. External stores could be carried on five hardpoints (one underneath the fuselage, one underneath each wing, and one at each wingtip).